Love this movie. Probably my favorite of all time. I heard that when this movie came out, there were so many papers written about it that a French philosophical conference had to begin turning them away. The protagonist (Phil) undergoes a transformation through a series of attempts to find meaning in the midst of a ceaselessly repetitive life. First he tries hedonism (no tomorrow = no consequences), then he tries altruism (hedonism was empty so I’ll try to make my life count for something), and then he descends into nihilism (what’s the point, just end it all). Finally he pursues love (which fails at first, too) and breaks out of the cycle. In a way, it’s an allegory about the evolution of (Western) philosophy. I’ll leave it to you to figure out how that can be. It’s also a kind of Buddhist version of the book of Ecclesiastes. Bit of trivia: The director’s wife is a devout Buddhist. Incidentally, I originally wrote a completely different blog, but decided that some things are too sensitive to share in the heat of the moment. You’ve got to let them cool a bit. Blogs are tempting things, but they scatter your thoughts to the four winds, and care has to be used. These little square letters under my finger tips are dangerous things. I want to write some about emotionally healthy spirituality. But like so many things I’d like to share right now, they have to wait their turn. In the meantime, I’ll be plopping down on the couch once again this year to watch Groundhog Day. Can’t really explain why it means something to me on a personal level, but somehow it does. Maybe some day I’ll figure it out. This entry was posted on February 2, 2009 at 4:41 pm and is filed under Uncategorized. You can follow any responses to this entry through the RSS 2.0 feed. You can leave a response, or trackback from your own site. 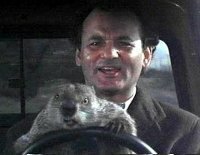 I used to use Ground Hog Day in my philosophy class. Lots of philosophical and psychological insights throughout. Two “Phil’s” … the groundhog and the main character. Human nature portrait: what will humans do when they can do whatever they want without consequences? Second, despair and hopelessness, the product of hedonism. Third, which in his case he was prompted by Andy M., altruism. On another note, have you seen the new Chronological Study Bible published by Thomas Nelson? It’s a gorgeous work. I highly recommend it. Maybe it means that you’re a closet Buddhist…?